During their non-public school marathon last month, students at First Lutheran School in Glencoe raised $4,900, surpassing Principal Dean Scheele’s goal of $4,500. As promised, Scheele agreed to shave his head. 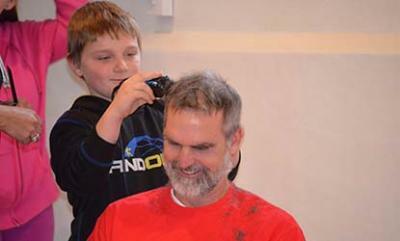 One student from each grade, kingergarten through eighth, had the chance to cut the principal’s hair. Above is Kyle Hagen buzzing the hair of Scheele’s soon-to-be chilly head.